A 53’ Suenos powered by quad Seven Marine outboards. If you think the horsepower battles in the outboard market have slowed, the latest sales statistics for Seven Marine — maker of the largest outboards in the industry — are telling. 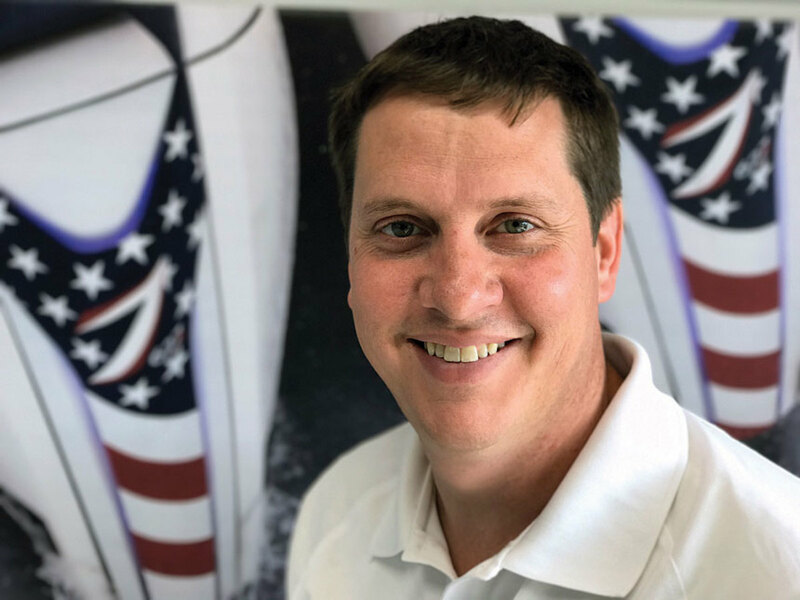 In December, sales at Seven Marine, which is based in Germantown, Wis., were up more than 50 percent from the company’s best-ever December and by more than 20 percent from its best-ever month. The company also took its first European orders in the last month of 2017, after Volvo Penta purchased Seven Marine during the summer. 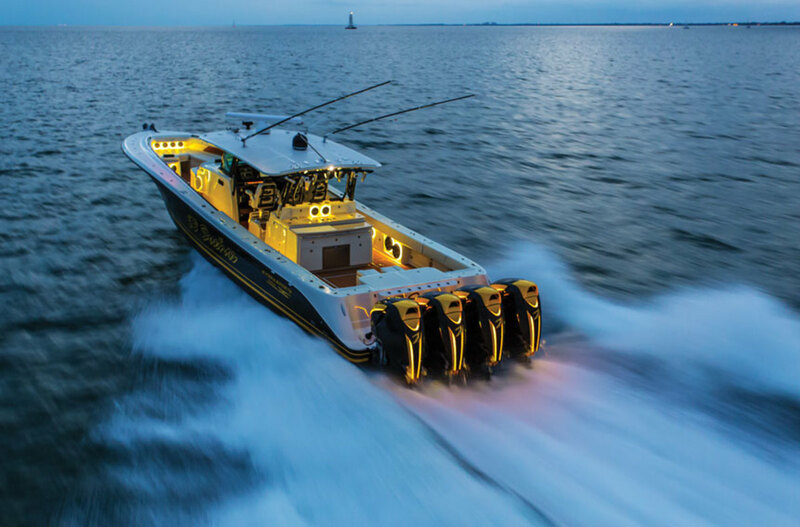 Seven Marine builds 557-hp and 627-hp outboard motors based on a General Motors LS7 automotive V-8 powerhead. 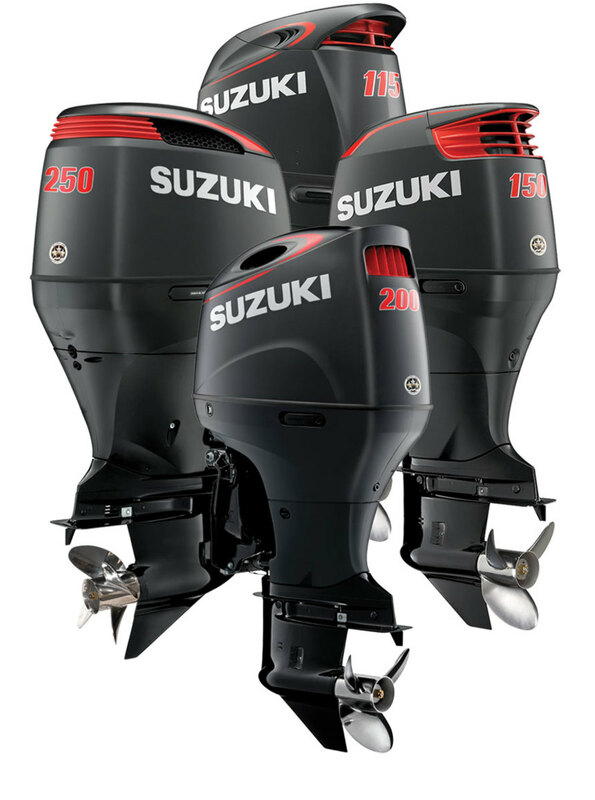 With the introduction of Suzuki’s DF350A this past June, all outboard manufacturers except Honda Marine now offer a motor that produces at least 300 hp. And an increasing number of builders are putting those engines to use: At November’s Fort Lauderdale International Boat Show, S2 Yachts unveiled its Tiara Sport series of outboard-powered luxury dayboats. The first model, the 38 LS, has triple 350-hp Yamaha 4-stroke outboards. Also increasing is the number of outboard-powered boats over 40 feet, each with at least three or four big outboards clamped to the transom. HCB Yachts’ 53’ Suenos measures 52 feet, 11 inches, with a 13-foot beam. She’s powered by quad Seven Marine 627s. Midnight Express has a 43-footer that can be powered with quad engines ranging from Mercury 350 Verados to Seven Marine 557s and is working on a 60-foot center console. Suzuki says its matte black finish has been popular with younger boat-show visitors. Nor-Tech Hi Performance Boats used to be known for custom offshore vee bottoms and catamarans, but its best-selling models now are 39- and 45-foot center consoles powered by, you guessed it, multiple Verado 400Rs. And Formula has a watersports-focused version of its new 43-foot outboard-powered model, the 430 ASC. The base motors are quad 300s, but the majority are being ordered with a quartet of Mercury Racing Verado 400Rs. Intrepid has five models starting at 40 feet and powered by multiple high-output motors. 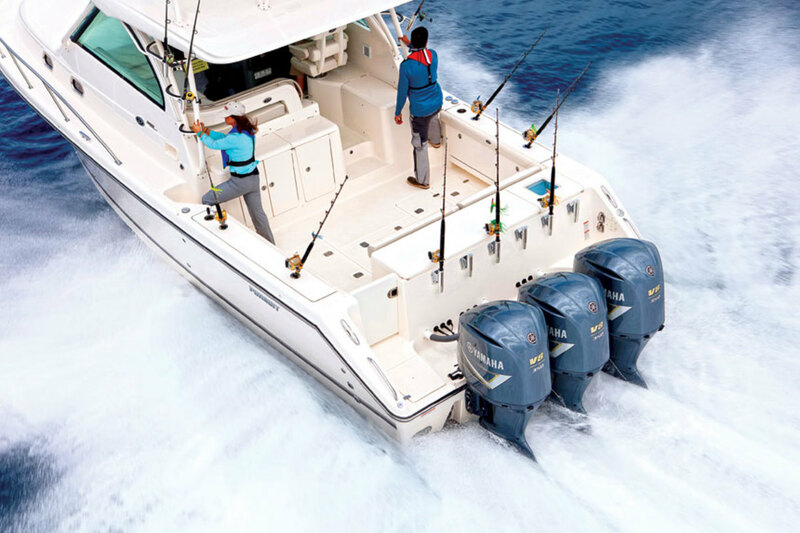 SeaVee’s 430SE can be powered by quad Mercury outboards and Yellowfin’s 42 Offshore is available with triple or quad motors. At the upcoming Miami International Boat Show, Evinrude is expected to have two boats powered by quad E-TEC G2 300s, and Suzuki is promising four of its DF350A outboards on a 47-foot catamaran built in Taiwan. There will undoubtedly be plenty of boats powered by multiple high-output engines from Mercury and Yamaha, as well. One of the first products that Seven Marine and Volvo Penta co-developed is a twin-prop lower unit for Seven Marine outboards that Davis says will go into production in February or March. The company will then have three gear case choices: the GT, for high-speed applications; the standard unit, for speeds from 60 to 85 mph; and the twin-prop version for heavier boats running less than 60 mph. “We’ve had it as an idea, but until the Volvo partnership, we weren’t able to put it in production,” Davis says of the twin-prop unit. As the saying goes, there’s no replacement for displacement, and using a 376-cubic-inch (6.2-liter) V-8 block gives Seven Marine a serious advantage in terms of bottom-end and midrange torque. The characteristics make the motors good candidates to power boats of more than 40 feet. Seven Marine is not the only manufacturer building outboards with an automotive powerhead. Honda Marine has been using its V-6 car engines as powerheads for its outboards. It could be argued that the introduction of the Mercury Racing Verado 400R in 2015 helped usher in the current era of big outboards. The response caught even Mercury Marine off guard. “The demand we had for that engine, and even the 350 and the 300, outpaced our expectations,” Mercury Marine President John Pfeifer says of the 400R. Gus Blakely, Suzuki’s vice president of marine sales, says his company has had a similar experience since it introduced its DF350A. Perhaps the best news for Mercury fans is that the company isn’t done when it comes to output. Yamaha’s big outboards have been the choice of offshore anglers for years. A decade ago, the typical family boat was a sterndrive-powered runabout. 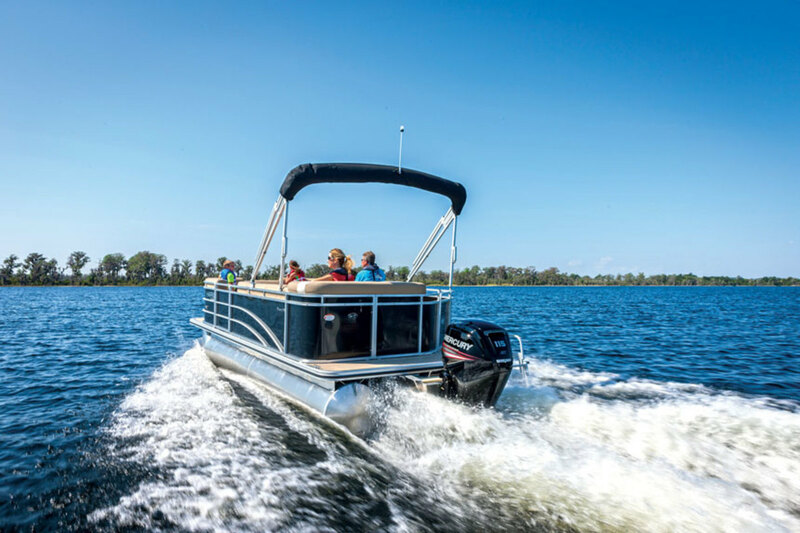 Today, more people are seeking versatility in pontoon boats, multispecies aluminum fishing models and center consoles, all powered by outboards. “People who used to buy a pontoon with a 60-hp motor are now putting on a 115,” Pfeifer says. According to Statistical Surveys, outboard sales grew by 7.5 percent in 2015, 6.9 percent in 2016 and 5.8 percent last year; fiberglass outboard sales grew by 8.6 percent in 2015, 7.7 percent in 2016 and 10.3 percent in 2017. Aluminum outboard sales were up by 7 percent in 2015 and 2016, and 3.6 percent in 2017. Conversely, sterndrive sales were down by 7.8 percent in 2015, 2.4 percent in 2016 and 5 percent in 2017. Most manufacturers don’t provide sales numbers, but Walton says 2017 was Honda’s third consecutive year of growth. Sales were up 16 percent. Mercury Racing’s Verado 400R features a supercharged V-6 powerhead. In terms of units sold and produced, Pfeifer says Mercury’s most popular power range is 40 to 115 hp, but the biggest dollars sold are in 250-hp motors and above. Across the board, the No. 1 on-water activity that outboard motors power is fishing. Anyone who has worked in an inboard or sterndrive engine compartment knows they have limited space. An outboard, on the other hand, is bolted to a boat’s transom, making it easier to access for maintenance, repairs and replacement. And the motors are not “marinized” truck motors mated to drives. Honda’s Walton says people are reassured when they see a recognizable name on an outboard cowling. Proponents of outboards have long sung the motors’ praises when it comes to winterization. Because the outboards drain when not in use, no water is trapped in the motor, so it can’t freeze and crack the block. Evinrude has a clever function that basically winterizes the motor with the push of a button. If you’ve winterized your motors and a warm stretch during the off-season beckons you back to the water, just go boating, then rewinterize the motor when you get the boat back on its trailer. He also says the 627 and 557 have been three-star CARB- and CE-compliant from the start. The same goes for Honda and its V-6 powerheads that are based on automotive products. Evinrude has the lone 2-stroke outboard on the market, and Tracy Crocker, senior vice president and general manager at Evinrude/BRP, says the company has made a “significant investment in fuel-emissions research.” The E-TEC G2 series also has a three-star CARB rating. “Our intention is to continue to push our clean-engine innovation into more products in our line,” Crocker says. With the marine industry focused on improving the operator’s experience, high-output outboards needed to become user-friendly. All of the major brands have digital shifting, which makes taking the motor in and out of gear effortless and places less stress on the equipment. Additionally, all have controls that permit the operation of as many as four motors with single or twin levers, plus an advanced steering system. The Verado 400R has electro-hydraulic power steering; Seven Marine has an integrated system. The Evinrude E-TEC G2 series has the hydraulic steering unit in the midsection, which cleans up rigging. 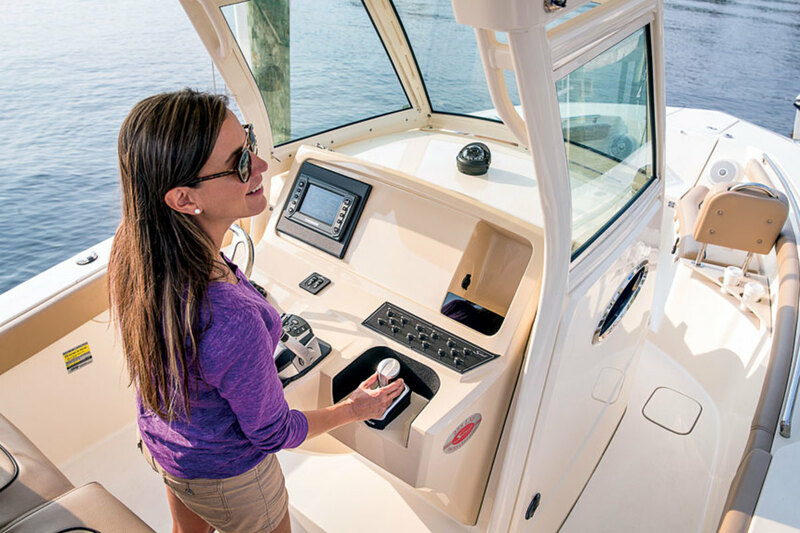 A joystick system such as Evinrude’s iDock makes it much easier to maneuver a boat. Most modern outboards are also fuel-injected, which makes them more efficient. And outboards have a power-to-weight advantage, and can be trimmed out of salt water when not in use. One of the most popular controls on any outboard motor is a joystick. Mercury, Yamaha, Evinrude and Suzuki have them to take the intimidation out of docking, even aboard a large, multiengine boat. Seven Marine uses ZF electronic controls and the company’s joystick. Virtually all of today’s big outboards are also available with station-keeping capabilities. Suzuki’s AP series has selective rotation instead of counter rotation. The design is basically an electrical circuit. In standard rotation the circuit is left open, and for reverse rotation the circuit is shorted out. Evinrude offers more colors in its E-TEC G2 series to customize a motor’s appearance than any other manufacturer. Whether an operator is a seasoned veteran who doesn’t want to mess around with adjusting the boat’s trim or he’s a newbie who hasn’t fully grasped the concept, Mercury’s ActiveTrim, Yamaha’s Trim Assist and Evinrude’s iTrim take care of the task. And gone are the days of individual instruments at the helm. Mercury’s VesselView, Yamaha’s CL7, Evinrude’s Icon Touch and Suzuki’s C10 provide all engine information on a single multifunction screen. Honda’s Walton says the company is working on expanded technology for its motors. Mercury, Evinrude, Yamaha and Suzuki also have mobile apps that link the engines to a smartphone. There’s no doubt that enhancing the overall operating experience is the No. 1 priority, but the appearance of the outboards is becoming more important — and not just on the big motors. Seven Marine offers custom graphics, and Evinrude has the lead when it comes to color matching, with wraps and custom paint on the E-TEC G2 series’ side panels. Mercury offers its Verados in the company’s traditional black and three shades of white, and the Verado 400R is available in a carbon edition. Evinrude&apos;s E-TEC G2 series in black panels with yellow accents. For 2017, Honda offered its factory-painted Grand Prix white finish on its BF 250, and 200 and 225 models, and in February the BF 150 will be available with the same color. Walton says that during the past 24 months, his company has refreshed or introduced 15 models as updates or new models. The company is coming off updates on its 40- and 50-hp outboards, and the 75-hp, 90-hp and 115-hp models were updated last autumn. In the fall of 2016, new BF4, BF5 and BF6 motors were introduced. Suzuki has had white outboards for about five years, and the color is available down to 40 hp. At this year’s Miami International Boat Show, the company plans to introduce 25- and 30-hp motors in white, to match tenders. In late 2017, Suzuki added a 25-inch shaft length for its 250-hp model, and 20- and 25-inch lengths for the 200. “We’re trying to give people as much flexibility as we can,” he says. Sticking with smaller motors, Yamaha recently introduced its F25 C EFI motor, which the manufacturer says is lightest in its class. Features include integrated variable trolling rpm, combination pull and electric start. And Yamaha recently introduced the second generation of its 4-stroke outboards with a lightweight F200 four-cylinder motor, a new F115 inline four and a new F90. Mercury has replaced two carbureted engines with 15- and 20-hp EFI 4-stroke models that are more fuel-efficient. Additionally, Pfeifer says the company has gotten positive feedback on its ergonomically designed tiller handles. “There’s lots and lots of avid recreational and commercial people where that’s a big deal,” he says. Even pontoon-boat owners have been going with bigger motors in recent years. He adds that 2016 was a record investment year for Mercury, and that introductions won’t be focused on one-time events in the coming year. Because it is owned by Brunswick Corp., Mercury will continue to have exclusive relationships with builders such as Boston Whaler and Harris Flotebote. Yamaha has more than 20 exclusive supply arrangements, and Honda will have 10 new OEM agreements this year. Still, all of the manufacturers say they have been talking with a broader range of boatbuilders, many of which would not be considered “outboard boat” makers. That chatter could mean big outboards are only going to get bigger in 2018. “As long as we can keep the dollars per horsepower in line, we’ll continue to see the limits pushed,” Pfeifer says. Seven Marine’s Davis estimates that at least 10 manufacturers will build outboard-powered boats larger than 50 feet in the coming year. “It only legitimizes that the big outboard market is here to stay,” he says.